The iDredgeTM commissioned by Africa Resources and designed and fabricated by proudly South African company Imilingo Mineral Processing has produced a whopping 14,1 carats from 1200kg of alluvial/gravel deposits in the Kasai River of the DRC in the first test run. 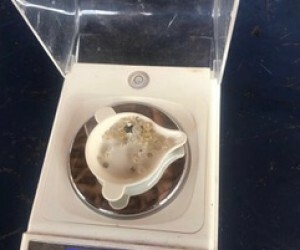 Over many years, traditional river-based alluvial diamond mining has seen divers scouring the riverbed with heavy suction pipes coupled to centrifugal pumps. Thomas Häggkvist, the CEO of Africa Resources AB, approached Imilingo Mineral Processing in October 2016 for a possible solution to the cumbersome and hazardous diving conditions involved in alluvial diamond recovery. “Modern mining techniques and sorting technology has been severely lacking in alluvial diamond mining and the iDredgeTM has certainly delivered in injecting some much needed technological advancement in the industry,” commented Häggkvist. The iDredgeTM began the long journey from Imilingo’s Centurion fabrication facility in December 2017. Road transport to the port at Durban took a week and after 17 days at sea, the two 40ft and two 20ft containers arrived at the port of Matadi on the West Coast of the DRC. The contents of the 40ft containers were unloaded in the port and loaded onto trucks while the 20ft containers were loaded onto the trucks as-is. From there the trucks hauled the modular components to Kinshasa and onwards to the Kasai River. Local villagers keen for employment and training assembled the 150 mm pipes using wooden dugout canoes to attach the HDPE floaters to support the pipes in carrying the dredged material to the shore. “Once the pump was started, it effectively pumped sand to reach the river-bottom bedrock. 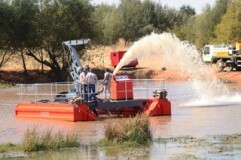 The dredged sand was sized on a vibrating screen and the material was then sifted by hand in what the local people term a ‘tammy’ that is French for sieve,” said Prinsloo. After the Imilingo commissioning team left, the local site team continued operations and cleared the river bed of sand overburden before reaching the diamond gravel. The first diamond gravel was pumped on the 29th August 2018 and then washed by “tammy” to recover the company’s first diamonds. The test run shows great potential for Africa Resources’ operations in Tshikapa and all parties are immensely optimistic at the prospect of diamond recovery in the area. 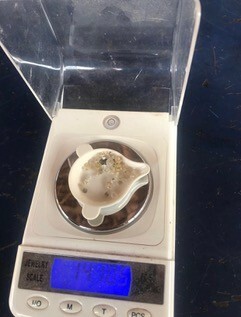 “The test run showed bags of promise with 14,1 carats from 1200kg which would equate to 1175 cpht based on the isolated test. We are really excited about the yield this project could potentially generate and know the extensive efforts to unlock the mineral wealth will definitely pay off,” concluded Häggkvist.